PT Bank Maybank Indonesia Tbk - Maybank Indonesia is a well-established Indonesian privately-owned commercial bank. 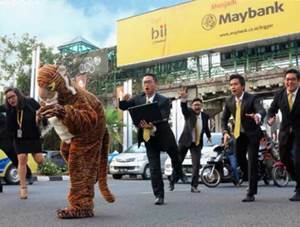 Maybank Indonesia offers a full-range of general banking produces. Its products include retail banking, global banking, business banking, global markets as well as sharia banking. Maybank Indonesia was formerly known as PT Bank Internasional Indonesia Tbk (Bank BII) and changing name into PT Bank Maybank Indonesia Tbk since 23 September 2015. Maybank Indonesia is a local subsidiary company of Malayan Banking Berhad (Maybank Group), Malaysia's largest financial services group and the leading banking group in South East Asia. As of December 2016, Maybank Indonesia is 78.98% owned by Maybank Group through Sorak Financial Holding Pte Ltd (45.02%) and Maybank Offshore Corporate Service (Labuan) Sdn Bhd (33.96%). The remaining 21.02% interest in Maybank Indonesia is owned by UBS AG London (18.31%) and general public (2.71%). Based in Jakarta, Maybank Indonesia conducted business operations under the management of 9 regional offices, 393 conventional branch offices, 79 main branch offices, 31 sub-branch offices, 1 cash offices, 2 overseas branch offices, 9 sharia branch offices, 7 sharia main branch offices, 2 sharia sub-branch offices, 1 micro sub-branch office, 23 micro functional offices and 19 mobile cash units (at the end of 2016). Maybank Indonesia also supported by 2 key subsidiaries; PT Maybank Indonesia Finance (99.99%) and PT Wahana Ottomitra Multiartha Tbk (68.55%). According to PT Bank Maybank Indonesia Tbk Annual Report 2016 as cited by JobsCDC.com, Maybank Indonesia is running well in the full year of 2016. Maybank Indonesia managed to record a total asset of Rp166.67 trillion at the end of 2016. This number is up 5.74% from Rp157.61 trillion in 2015. Referring to its annual report, Maybank Indonesia booked total Profit After Tax and Minority interest (“PATAMI”) of Rp1.9 trillion in 2016 or increased by 71.0% from Rp1.1 trillion in 2015. Total net interest income (NII) increased by 10.8% to Rp6.6 trillion. A Bachelor degree (S1) in any field with minimum GPA of 3.00 from reputable university in Indonesia or overseas graduates. Final year students with maximum 6 months to graduate are welcome to apply. Smart, excellent communication skill, good analytical thinking, dynamic, agile and passionate to become a leader. JobsCDC.com now available on android device. Download now on Google Play here. Please be aware of recruitment fraud. The entire stage of this selection process is free of charge. Maybank Indonesia - Fresh Graduate Young Maybanker Program Maybank March 2018 will never ask for fees or upfront payments for any purposes during the recruitment process such as transportation and accommodation.